It involves Alexander Gun (note spelling) of Killearnan. Mark Rugg Gunn considers he held the lands of 'Killearnan, Navidale and Easter Balnavaliach' (page 168). This document of 1652 (the year of 1652 is given on the back) has a different list of properties on the sixth line. The Mark Rugg Gunn properties may have been held later or earlier - or not held at all. Given the legal nature of the document it is probable that all lands then 'owned' would have been listed. The document involves Alexander Gunn and John Gunn of Borbool (obviously Borobool). This is really good stuff. The John is very unlikely to be Alexander's father John (another Mackeamish) as one assumes the father would have been listed first. 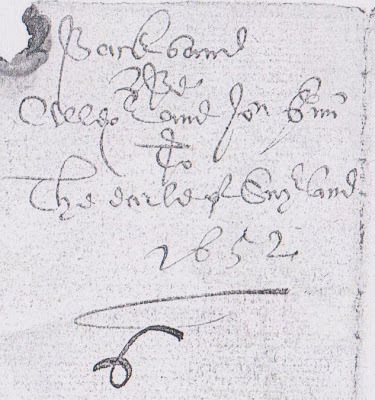 It can't be Alexander's son John as Alexander is born c. 1625 and the document is 1652. It must be a relative though; who else at that time would you get into a serious legal document? I suspect therefore we have new information. Previously Alexander's son was viewed as George Gunn of Borrobol. It now seems more likely, given the document, that Alexander Gunn (Mackeamish) had a brother John Gunn of Borrobol - and that his son was the George Gunn previously assumed to be the brother of Alexander. This markedly alters anyone claiming to be 'Chief' through the Borrobol line (consider Rhives). The 'signatures' are fascinating; Alexander is Gun; but John is Gune / Gunee / Gunes (with a line over the u) which shows both names were operating at the time. Now Gune gets very close to Smibert's argument about the origin of the Clan Gunn (which is not Norse; note that family names weren't even fixed in 1652 let alone in Orkney times).